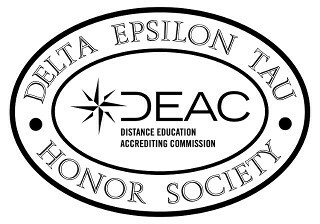 Charters for chapters of Delta Epsilon Tau may only be granted to institutions accredited by the Distance Education Accrediting Commission. The original group shall include the institution's chief executive officer, an academic officer or senior faculty member and those students and others who qualify under Delta Epsilon Tau standards. The applicant shall pay a one-time charter fee based on total enrollments of the institution. There are no dues for member schools or individuals. The base charge for each member is $45. Honor Cords are $15 each. Each honor student elected to membership receives a personalized membership certificate which includes the name of the college or school, the chapter name, the date of graduation and the official Delta Epsilon Tau Gold Seal of Distinction. The individual membership fee is paid by each honor graduate. As an added service, each honor student also receives a special congratulatory letter from Delta Epsilon Tau and a narrative about the society. Upon request, letters of reference are provided. • Maintained over the minimum qualifying grade point average (as determined by the Chapter). Institutions may also elect faculty, staff, alumni and honorary members. These individuals should have distinguished records of service to the institution or be recognized leaders in their fields of work. Honorary members may include community leaders, state officials, employers, Members of Congress, or in some cases, members of the media. Chapters may be suspended or expelled for failure to comply with Delta Epsilon Tau regulations and policies. The institution shall publicize the nature of the society and the requirements for membership from time to time during each school term or year. Changes, modifications and additions may be made in the regulations and policies of the society by the national office, to be effective on publication or written notice.